Shadow cabinet minister Jonathan Ashworth has visited Ipswich to see the town’s growing business area in Princes Street. Jon's role in Jeremy Corbyn’s shadow cabinet, is responsibility for co-ordinating between the party at Westminster and local councils. 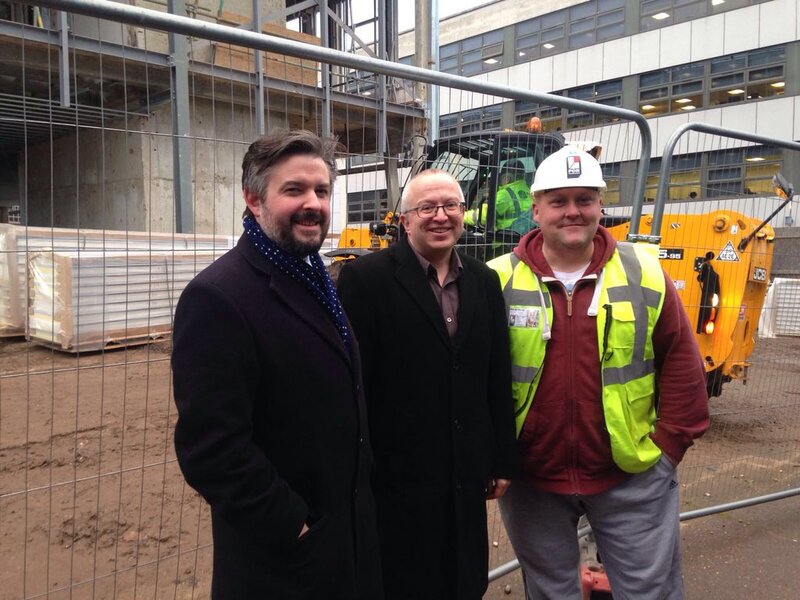 Jon visited Ipswich to see what a Labour authority was doing to boost business and regeneration in the town. He visited the Princes Street area to see the new Connexions business centre that is rapidly taking shape and the Portman House building which will be the new home to Archant, publisher of our two local newspapers. He was shown the area by Ipswich Borough Council leader David Ellesmere who told him how the borough had promoted the development of the business area, and also bought and sold sites to allow projects to be built. Jon was last in Ipswich in 2001 when he was part of the Party's by-election team and was able see a major improvement in the town, compared to fifteen years ago. The borough sold the former Fisons building to developer Malcolm Hobbs who is turning it into the Connexions business centre. Work is continuing on site – and should be completed by the spring. Mr Hobbs said: “We have had a great deal of interest in the site and about 60% of the space is being considered by possible tenants, although in this business they like to see what it looks like before making the final commitment. The Borough has bought the former Hollywood nightclub which will find a new use. He concluded his visit to Ipswich with a meeting with local Labour members at the Station Hotel.